Boy, oh, boy, do I owe you some blog posts. I hate slacking this time of year. So much is going on and by the time I sit down to type at night, I end up distracted by last minute decorating, or baking, or online shopping. Or, as seems to be the case of late, going to bed at 8:00 PM and sleeping like a rock. We’ve also had a field trip, a leaky roof that required two days worth of repairs (they were amazing and fortunately, the damage was was covered by our warranty), and I decided, in a burst of Pinterest-inspired energy, to make all kinds of ornaments and things. And so it goes. Here’s how this week shaped up. Obviously, a very full and detailed report is coming this week, but… man, I love this race. From the course to the people to the volunteers. I just feel like it’s “my” race. This is my second time I’ve journeyed to Cocoa, and I can’t wait to try again next year. For Mr. PugRunner, it was a little more challenging. After being so ill and unable to run for two weeks, I think he did great. He struggled with cramps and fatigue, but he pushed on and through and can now call himself a half-marathoner! After the race, we had some complications. We were on a bit of a time crunch – for Father’s Day, we had given my stepdad tickets for the Jaguars vs. Giants game (he’s a huge Giants fan), and we planned to shower quickly, and drive back two hours in order to take him. Well. There was a bit of a shuttle snafu (the bus we were supposed to be on hit a parked car, which created a traffic jam and a backlog of shuttles – no one was hurt, only property damage), so we were an hour behind. We made great time to our appointed pick up spot and would have only been a little late to the game, when five miles off our exit, we encountered awful traffic. And I had to go to the bathroom. Badly. It was to the point that I almost would have hopped out of the car and run the rest of the way to the nearest restroom. When we finally pulled off the exit, I realized there was no way I would be able to make it to the game without several potty stops en route. I handed the tickets to Mr PugRunner, told him and my stepdad to have a wonderful time, and bolted for relief. I felt awful about missing out, but I wanted my stepdad to have as wonderful a time as possible. Obviously, this was the day that the Jaguars would decide to make the greatest comeback in franchise history, coming back from an 18 point deficit to win by one point. We tried. And it was welcome! We had lots of laundry and unpacking and food shopping to be done, but I was able to knock it all out. I want to point out how great I was feeling physically. The first time I ran a half marathon, there was definitely soreness and limping and discomfort. This time? Nothing worth noting. That, in itself, made me feel great about my training and how far I have progressed. Little man had his first field trip of the year and I had signed up to chaperone. We visited a local historical spot for a few hours, and it was extremely interesting and informative. Afterwards, the kids enjoyed a picnic lunch and we were able to sign them out and take them home after. Usually, little man likes to go back to school, but this time, he decided he wanted to come with me, even if it meant running to pick up some items for our costumes for Saturday’s race. Why not? I was between a half marathon and two races on the weekend. “Sleeping in” isn’t a regular thing, and sometimes, it’s nice to take advantage of it. And anyway, my parents were coming over to help me set up the Christmas village. It’s a daunting task and my mom is absolutely amazing the tucking all the wires beneath the fake snow. I’m so incredibly grateful for the help (and little man was ecstatic to come home to find the village in full, functioning order). We all went to lunch, and then mom and I went to pick up some artsy-type things before little man got home from school. Tis the season to be crafty, right? I had the pleasure of meeting up with S from the local MRTT chapter. 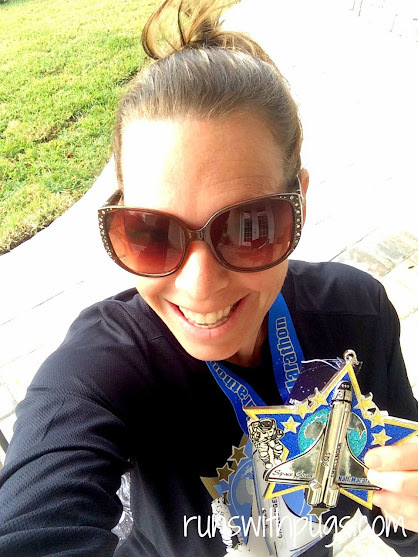 She lives a few neighborhoods away, and is an interval runner. We enjoyed a nice and easy three miles and I felt sufficiently warmed up for the weekend. Mr PugRunner wantend to take little man to pick out a gingerbread house kit (it’s their tradition to make a gingerbread house), so I tagged along. We ended up getting pizza downtown, and admiring the Nights of Lights. It’s really fantastic, and I am hoping we can take another trip back to enjoy. I volunteered at little man’s school, and then it was off for not one, but two packet pickups! I had to get the family’s bibs for Saturday’s Gingerbread Man Dash and then mine and Angie’s bibs for the Divas 5K on Sunday. A thick fog was settling over the city, which made the drive a little scary, but I made it to the Health & Fitness Boutique, grabbed our bags and headed home. Since we were having house guests after our Saturday race, we got takeout sushi for dinner and then it was early to bed. After breakfast, we rushed home to tidy up for Angie and her family. Angie was running her very first 5K on Sunday and I was so excited to be able to be a part of her awesome day. When they arrived, we went to lunch on the beach, and then spent the rest of the day, lounging at the house, making gingerbread houses and enjoying the fire pit. I made a nice pasta dinner and the girls and kids turned in early so we could be fresh for the race. This was probably my most fun running week in a long time. PRs, costumes, friends and all kinds of awesomeness. I feel rejuvenated for the first time in a long time, and I’m hoping that the good energy will continue through the next month and some days to get me through 26.2 miles. It’s long run week, and I am staring down 18 miles. It’s going to get done, one way or another, but it’s certainly intimidating. One step closer to the big one, is how I’m trying to look at it. In the meantime, I’m just going to savor the positive feelings, enjoy what I’ve accomplished and focus on one step at a time. Do you have a particular race that is 100%, absolutely “yours.”? Tell me about it! 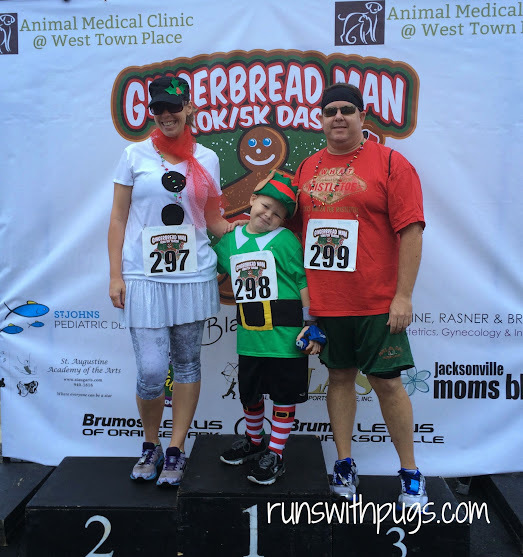 I love your costumes for the Gingerbread run. It was crazy foggy here too on Thursday and Friday. Today is the first day that the fog has kind of sort of lifted. It’s creepy. I’m having the same issues with online shopping and crafting lately… For sure interfering with my blogging and other social media related activities. That’s probably healthy though. Too much time on the computer isn’t good for you. I didn’t know there was a Diva 5K! I thought they only had half marathons. Definitely something for me to research! I can’t wait to read your race reports! Congrats to Mr Pugrunner on his first half, and the little man on his first 5K! I love that you all take part in the same sport. Such a healthy, happy family! Thank you! They were pretty basic but I’m proud I was able to whip them up! You’re right. Too much time on the computer isn’t good. But still. I have so much to write and note enough hours to write it! And something something brand consistency grumble grumble LOL! 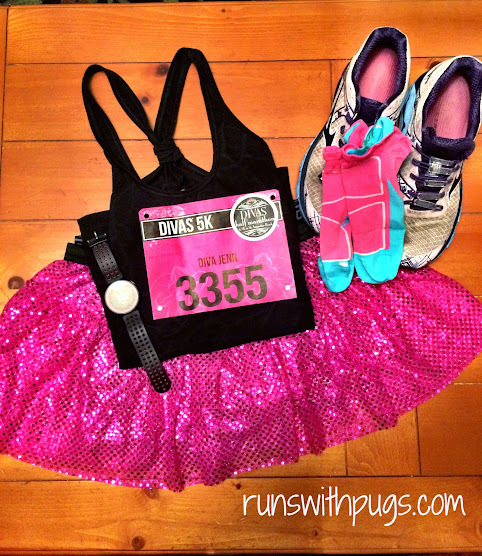 There WAS a Diva 5K! Definitely look into it closer to you. Or come down here! I love that we all run, too. It’s so nice to have a joint hobby/interest. Thank you for the kind words. After hearing you tak about the Space Coast Half, I really do think it’s a bucket race of mine! Especially since they launched the rocket this past week, I can only image how cool it was this year! Kudos to the Mr. For pushing through, and congrats on his first half! I’m officially signed up for Gate. I feel like that might be “my” race. I’m raven flying home for the weekend for it! How exciting! I am planning on a redemption year at the Gate. Fingers crossed I can get it done! I love the costumes for the Gingerbread Dash! Congratulations on Space Coast! I hope to run that course one day. That medal is so awesome. And I love the costume. I still haven’t had the guts to wear a costume yet, I will one day. It’s kind of fun. I always start out feeling so silly about it, but I don’t think I’ve ever regretted it.